good news for kids, your favorite malayalam kids show dora yude prayanam is coming back on kochu tv. channel have started showing the promo of the same, 1st april 2018 is the launch date for dorayude prayanam cartoon show. summer vacation started and april, may month will be the peak time for kocu tv. sun network started malayalam kids channel on 16th October 2011 and it’s getting through all leading cable/dth services. this will be a happy moment for kids, dora and her friends back to mini screen after a short gap. 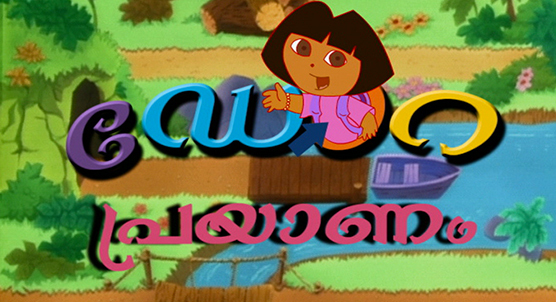 it’s the malayalam dubbed version of popular kids show dora the explorer, which started in 2000 and already completed so many successful season’s. dorayude prayanam is one of the popular show at kochu tv, during summer holidays this channel trp ratings will raise and they doing better performance. there is less chances for watching the show through sun nxt or any digital platforms. sun network only holding the television rights of the show, we will update the time of telecast here. this will be one of the prime time attraction for kochu tv, it’s the one and only malayalam cartoon channel. dora, buji, benny, kurunari etc are some of the characters of the show. each episodes telling a story, good dubbing is the main highlight of the show. jamyude jango vaal, talking tom and friends, chitrashalabangalude lokam, little krishna, tree fu tom, balaveer, kochu varthakal, aniyan bava chettan bava in snow daze, vikuruthi kuttan toto, villalli veeran, the pink panther show etc are some of the programs showing on the channel. Talking Tom and Friends is another show attracted by kids. This will be a special vacation for kids with dora, talking tom etc and other kids programs.